Playing music is easy, just choose a media player of some sort and fire up a few songs. With the right plugins or codecs installed, you will hear sound pouring from the speakers. Easy. However, finding the right software to suit your needs, taste and mood, and help you organize music – is not. Today, we have a little contest coming up, between Amarok, Clementine, and Tomahawk. 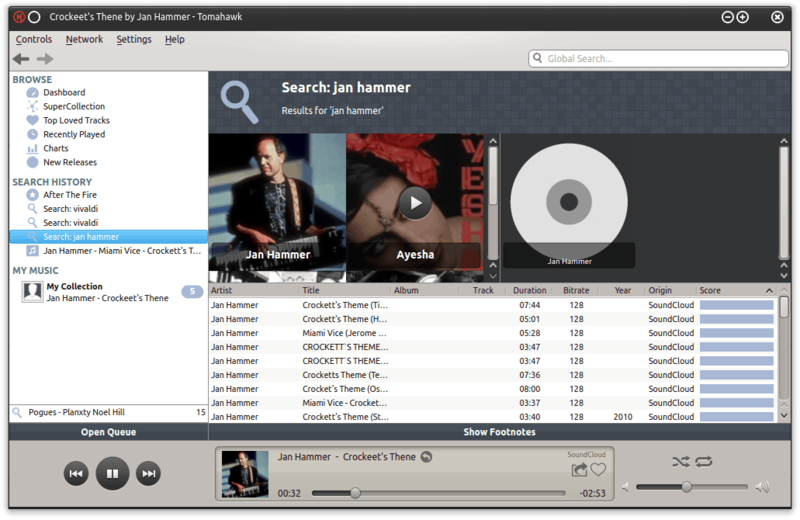 As you probably know, Amarok is a popular music player for KDE desktops, perhaps the most popular. The list of capabilities is truly impressive. Amarok will run on Windows, if you are so inclined, and it will adorn your other Linux desktops quite well, too. Then, it offers playback in a whole range of formats, tagging, cover art, playlists, online streaming, podcasts, and support for a range of media devices, including generic USB sticks, iPod, Rio Karma, and others. I gave Amarok a lengthy spin on my Kubuntu 12.04 installation. 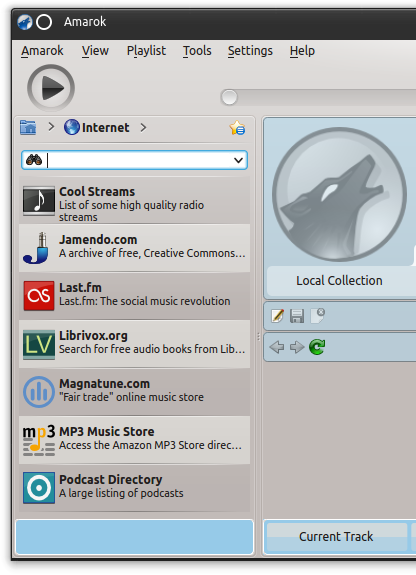 It is installed by default, so it will probably be the first experience for most KDE users. I have been using it for a while now, but never from the reviewer’s angle, which means exploring more than skin-deep. Amarok is a stylish, elegant product, with a three-column layout. On the left, you can choose between local sources and online media services, in the center, the songs will be played, and you can also check lyrics and Wikipedia information, while on the right, there are the playlist and search. The interface is fully customizable. I set about testing Amarok with a small bundle of great songs. What I wanted to know was how easy it is to organize your collections, rate songs, search for missing lyrics and cover art, manually and automatically replenish tags lost in the MP3 ripping process, listen to radio stations, and all the rest an average, entrepreneuring music aficionado might want. 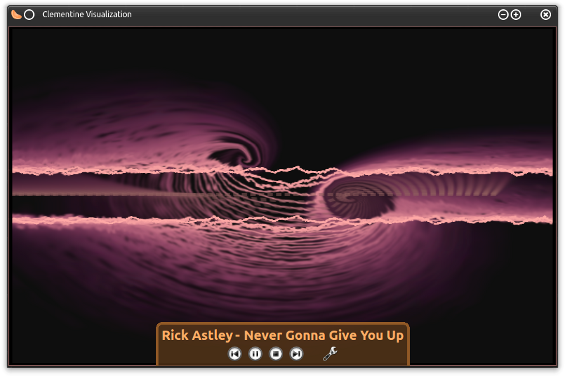 Cover art worked fine, although it depends on the meta data in your songs. If you rip your own collections, then you might want to invest some time populating all the fields, as this will make it much easier for your music players to fill in the blanks. For some of the less known artists, Amarok did not find any cover art whatsoever, even after fiddling with tags. For example, the Swiss band Yello was not a favorite, I guess. Indeed, tags are the trickiest part here. 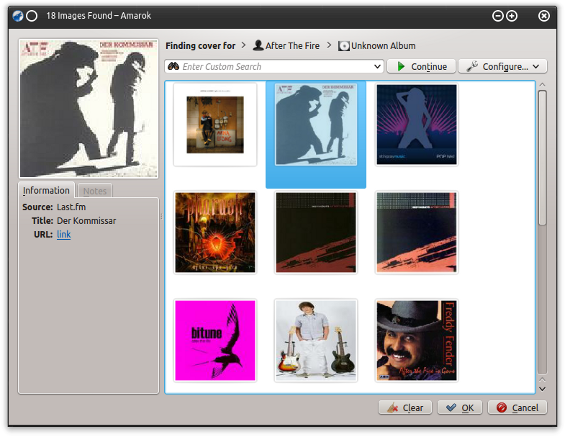 If you add them manually, Amarok will struggle finding the right cover art for your music. If you use the available MusicBrainz Tagger service , I don’t like the name with its quirky misspelled z instead of s, you will get your tags, but you might mess the cover art search even further. As it happens, after filling in the tags automatically, some of the cover art no longer showed up in the searches. Go figure. 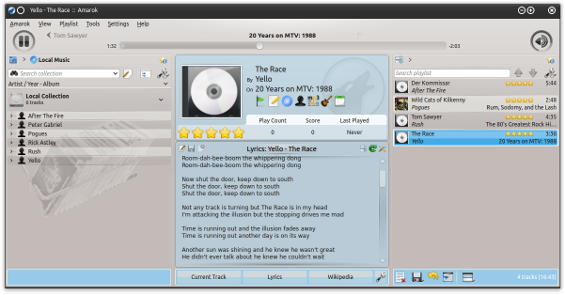 Lyrics worked for all of the selected songs, although the Karaoke style auto-scroll did not always match the pace of the song. Still, it’s a fairly benign omission. Online services were a bit clunkier. Some require that you register and login, although this is not apparent when you select them. Moreover, others are country-based, so if you happen to live elsewhere, you will be told that you have chosen an invalid country. Thank you. A dose of digital racism. The most important part is how natural the interface feels, right? Well, I must say I really dislike the playlists column on the right. It’s crowded with information, and the combination of stars and italic text really annoyed me visually. I cannot imagine what happens when you have hundreds of songs. Luckily, the playlist panel can be easily removed. 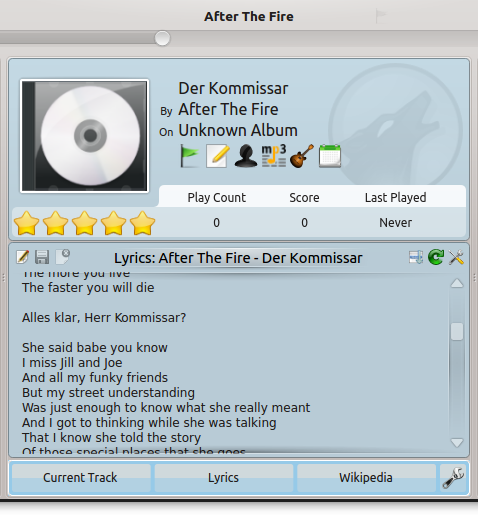 Amarok comes with a healthy collection of plugins, which lets you enrich your experience, or slim down the player to just a basic music software, your choice. 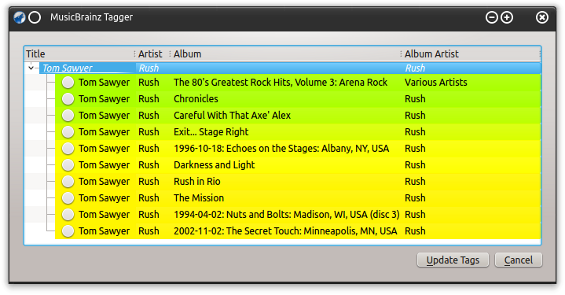 So you can use Audio CD, DAAP, iPOD, MTP collections, Samba sharing, NFS, and many other plugins. Unfortunately, having plugins does not mean they will work, because Amarok failed to identify, let alone play, music files stored on the SD card of my Android phone. Amarok surprised me by segfaulting while trying to enjoy some Vivaldi on one of the available online services. That’s not a nice thing to do. And I had such high hopes. 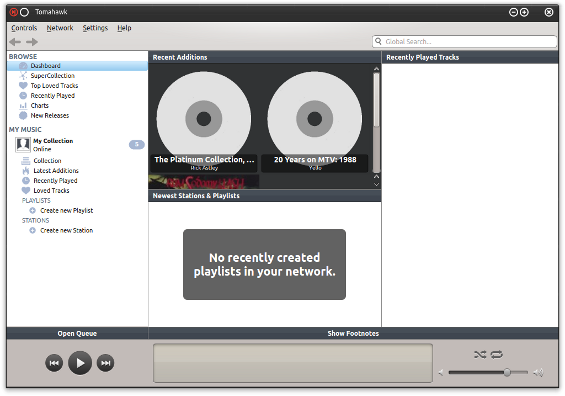 This music player is the unacknowledged twin brother of Amarok. Clementine was born amidst a political fury between those opposed to Amarok going from version 1.4 to 2.0 and those in favor. Eventually, the split resulted in a piece of digital citrus fruit. 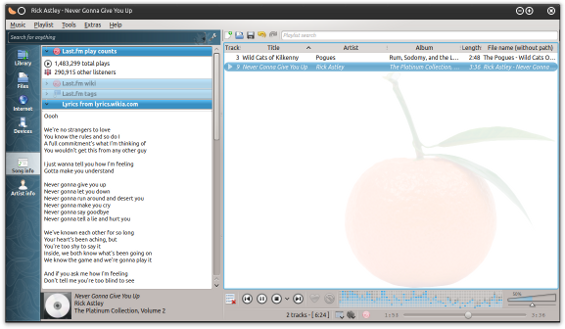 Like Amarok, Clementine is free, cross-platform, designed in Qt and therefore geared toward KDE desktops, but you can use it pretty much anywhere. 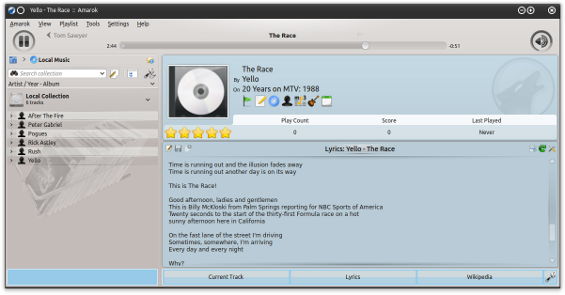 Clementine also boasts a wide range of features and capabilities, including Internet radio, sidebar information with lyrics, statistics, biographies, and pictures, tag and cover editors, dynamic playlists, transcoding, and support for music player devices like iPod. Compared to Amarok, Clementine sports a more conservative layout, with two panes. On the left, you get all the supporting information, plus the ability to switch views between local and online sources, external devices, as well as view detailed song and artist information. On the right, there’s a clementine-watermarked playlist. Much like Amarok, the ability to arrange the playlist with as few details possible is rather difficult, and you must fiddle with columns until you get it right. Not as friendly as I would expect, especially since everything flushes to the right edge. Italic does not help, either, but that’s my perception. Other than that, I must say I prefer the Clementine layout, as it’s simpler and cleaner. Now, the interesting bits. Clementine feels quite natural for use. It’s rather intuitive. Much like Amarok, it comes with a solid, fairly robust cover art and tag wizards, and in my experience, they offered pretty much the same quality of results. Clementine is also quite friendly when it comes to streaming. I managed to play all kinds of music from various stations, without any nags or restrictions. Again, you get large cover art, which adds style. Finally, Clementine lets you use extras, in the form of rain sounds, which can enhance the mood when you’re playing your songs, especially classical music. This was quite a lovely touch, in my handbook of class and style. I must say I was also most pleasantly surprised by Clementine’s willingness to use external sources. After connecting the Android phone, the music player correctly and gladly listed all of the possible sound files it found, and it even offered me cover art for some really obscure titles. Not at all what I expected. 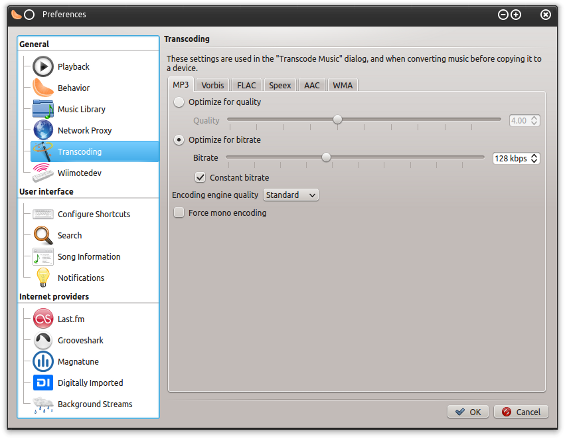 Another strong side of Clementine is the ability to transcode music files. You can convert between MP3, Vorbis, FLAC, Speex, AAC, and WMA files. This is a nice feature that has not been preserved in Amarok. And if it has, I have not been able to find it, which amounts to the same thing in the end. The third player in this bunch is relatively young, and you will not find it in the official repositories yet. To get it installed, I had to resort to using PPA, which might not suit everyone. Tomahawk is design to be a modern, sleek, fun, and cool. Like the rest of the bunch, it’s cross-platform and free. On first launch, it will ask you to configure its services, most notably online repositories that can be used to enrich your experience. The idea is to set them up front, and forget about any separation between offline and online, so you have a uniform and streamlined interface for all your needs. Not a bad idea. However, some of the services require registration and login. Tomahawk reminds me of Songbird. It has the cleanest interface of all, with a simple gray-white layout. It’s very to use, and at first, you might be baffled by the lack of complexity, like the separation between your local files and online radio and streaming channels. The experience was quite mixed, between superb and confusing. 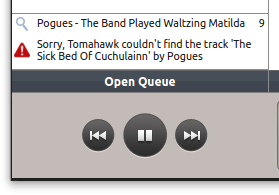 It took a long while for Tomahawk to index the various online services, until when my attempts to try to play various suggested songs resulted in errors. Then, I also had to tweak my services settings in order to start getting reasonably meaningful information for my searches. In other words, it took me 20-30 minutes to get going, and that’s a long time. And there’s that one extra pixel height in the left column that annoys me so. On the other hand, Tomahawk offers a superb layout of songs, with minimal extra information. It’s a visual pleasure for people who like it neat and clean, especially if they tend to get lost in the abundance of data that large collections of music can sometimes be. Cover art was spotless, but I could not find an easy way to change/edit tags. There were no lyrics either, although wiki information was available for artists and albums. However, it comes with a rather non-intuitive click on the artist/album icon, which you would assume should start playing the relevant item, when it fact it will only display the supporting information. You must select specific songs to play them. Online streaming took a bit to get going after tweaking the services. Some of the searches were a bit dubious, especially the heuristic match for similar songs and artists, which are used to auto-generate playlists. However, I was able to get most of the content I needed, although Clementine’s radio performance was much better. Now, let’s see how they fare against one another. Visually, Tomahawk leads with the best interface, closely followed by Clementine. When it comes to supporting information and services, Clementine is the best overall player. Both Amarok and Clementine give you great lyrics and good tags, but Tomahawk leads with cover art. 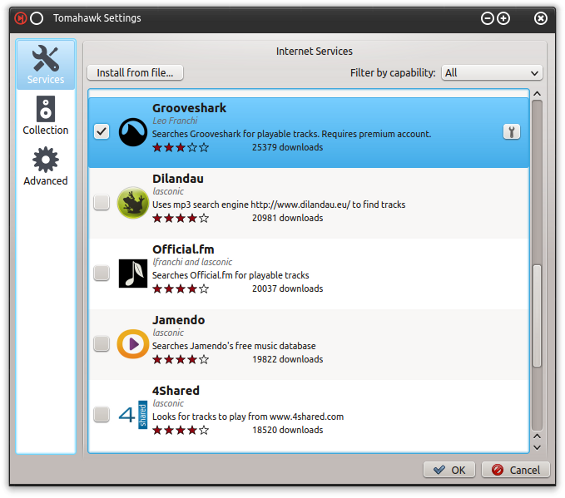 Playlists are tricky in all of them, with Tomahawk having the best presentation layer but the least accurate results. Amarok disappointed with its external device configuration and the subsequent crash while streaming. Speaking of online experience, Clementine gave the best results, with some rather neat extras. It’s also the only software with transcoding capabilities and visualization, among the three tested. And the winner is – Clementine. This Amarok 1.4 fork did not disappoint in any category. Some areas can be improved, but the ease of use and the combined quality of the local and online playback, wiki and lyrics information, effects, visualization, and all the extras place it at the top of my list. Tomahawk deserves the second spot, although it needs some polish. It could easily become a favorite, but it must focus a little more on the seamless promise of integration between offline and online sources. The work flow is quite good and the aesthetics are superb, so there’s a lot of potential there. Amarok, my default favorite, disappointed in a tight race against its brethren and sistren. With the valid country trick and the segfault nonsense, it fell off the chart. I was not pleased with most of the online services it offered, and it seems to be geared toward milking money first, great content second. Overall, it worked well, but there were passion and simplicity missing from the equation. Entirely subjective, but that’s how it is. Well, that’s all. Have fun, and enjoy your music. I too tried Amarok first because it was the default, and found its interface confusing and cluttered. 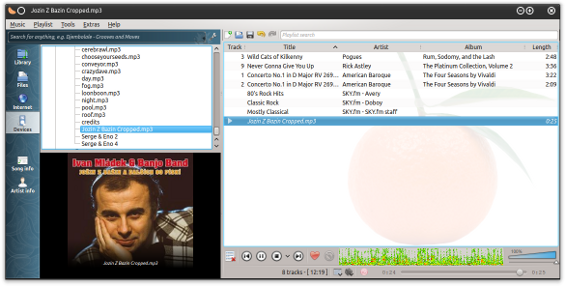 Moreover, something as simple as adding an internet radio station required me to wrap each station in a playlist. 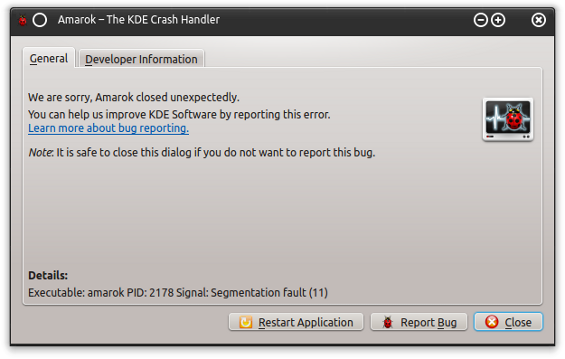 It was quite disappointing after hearing for years how Amarok was the greatest piece of software for KDE. Then I tried Clementine and, well, I haven’t looked at anything else since, and have uninstalled Amarok too. It just works perfectly for me. No clutter, and it plays both music from my own collection and random files without trouble. 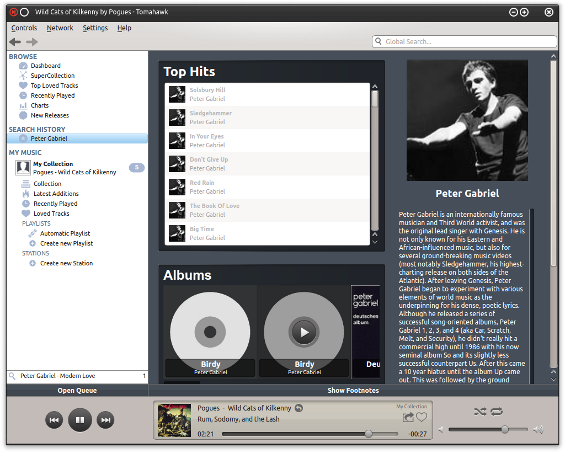 Whatever music player I try, I always come back to the one that does the job exactly the way I want it: QuodLibet. 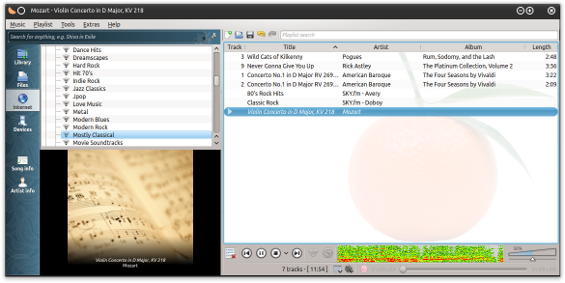 Cantata (MPD client) is by far the best for me. All the others lack some major and some (maybe) not so major features. 1. Gapless playback. No gapless playback (i.e. interruptions through The Wall etc), no music player. Gstreamer now supports it I guess, but it has supported some time ago too only to fail with the next release. Hopefully it’s stabel in that respect now. 5. Ability to have bit-perfect output, no sample rate conversion by the player or system. Cantata has got only one blemish: it re-draws album icons in every launch of the app and you need to scrool to the end of your library to see all your album covers displayed. 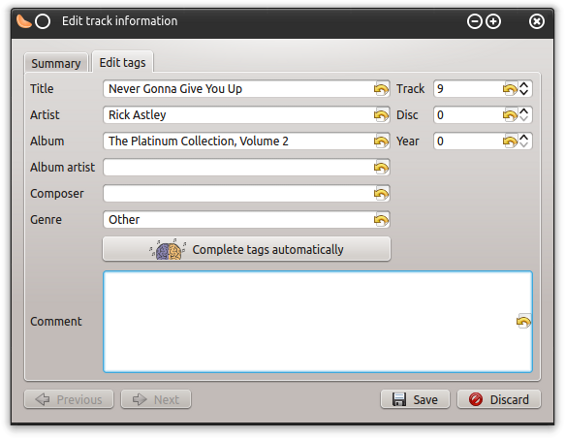 And you can easily configure shortcuts (of mpc) and use them with Cantata or any other MPD client or without any client. Cantata (though easy to compile from source both as a KDE app or Qt-only) must certainly be included in every major distro. Better yet, if possible, distros should provide an MPD-Cantata package to be easily installed just like a much inferior Clementine! Cantata-MPD is even better than iTunes except for that re-drawing blemish. Forgot to mention: And it’s very intuitive, clean, designed very rationally, involving just one or two clicks. Best in that very important area as well. 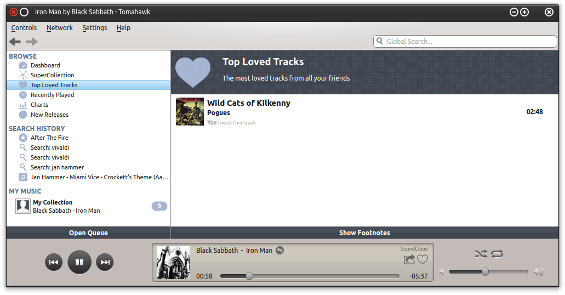 I personally find DeadBeef very rocking solid music player. 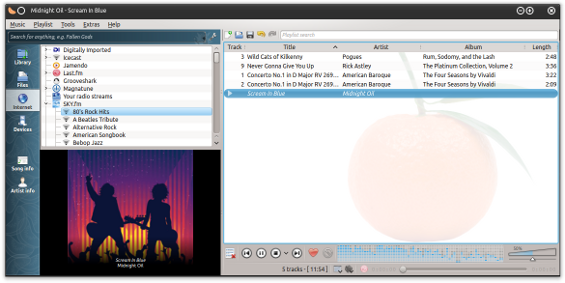 It is lightweight and provides simple and nice UI, similar to the one foobar’s has. DeadBeef is really the best one if you don’t need album cover grid view and I’ve been using it, but then recently Cantata has been created! Have to eat my words; come back to DeaDBeeF, as changing tracks cause MPD to consume %5-10 CPU, a bug filed on 2008 (can’t be fixed). Besides, it has lost bit-perfect output. Couldn’t solve either of these. Seriously? I’m the guy who wrote the Amazon integration. Each month I actually have to PAY money to make it possible for Amarok to offer that service. Yes, you read it. The income is that low that I actually have to give my private money to make it possible for users to have a store like iTunes, which actually is well hidden, doesn’t do anything unless the user wants it to and therefore offers better data protection than any other store I know. And it’s not our fault that Amazon is only available in a limited number of countries. Talk to your government to change that, it’s their stupid copyright laws that built up this barrier. We integrate great free services like Jamendo, the Free Music Charts (I moderated it for several years and wrote the integration) or LibriVox. We integrate new online services with great business models for authors and users, like Magnatune. All that in our free time. That sentence really was like a punch in the face. The emphasis is on seems. Look at it from the perspective of a first-time user who is not aware of Amarok history and certainly does not know you or your story, and then hits a couple of barriers that prevent him from using the offered services. The user will not be able to connect dots and blame the services, instead they will focus on the player that provides them. Perhaps free services should be the only ones, unless the paid ones allow seamless and simple, controversy-free user. Thanks, but you can be nice and disable the store if I happen to live in a non supported country. The fact I have to disable the Amazon Store manually speaks a lot about attention to detail. Was it really that hard? And how should he even know where you are? And what about if you say travel? I’ve used so many different ones over the years (Exaile, Amarok, Clementine, XMMS, etc) and Clementine definitely comes out on top for me. It’s simple yet powerful, like the difference between Transmission and uTorrent or Vuze. One question though…where’s VLC on the list? Seems like that is the unquestioned king of compatibility, simplicity, and power. VLC is awesome. But I guess it may not try to do all the magic that say Amarok do? But Amarok is the only one I’ve found that you can get shoutcast on.